Have you been considering getting lash extensions, but are still on the fence? Most women desire long, full, voluminous lashes, but achieving this look with mascara applications and other types of false lashes often fall short of their expectations. Some women are genetically blessed with gorgeous lashes, but most need assistance in achieving them. It seems as though all the beautiful models and actresses that grace the covers of magazines have naturally luscious lashes, but can you guess what their secret is? You got it: eyelash extensions. Here at Celebrity Lash and Brow Design in Glendale, we’re all about helping you enhance your natural beauty with semi-permanent and permanent makeup applications. Eyelash extensions are simply one more way to achieve stunning, effortless beauty without having to fully commit to permanent makeup. Today, we’ll explore the reasons why lash extensions are a must-try beauty treatment in 2019. When you’re ready to book an appointment, don’t spend time searching “eyelash extensions near me,” when Glendale’s Top Rated Local® beauty studio is just a call or click away! With eyelash extensions, there’s no need to apply messy mascara or flimsy false lashes. Applying mascara darkens and lifts the lashes, but one wrong move during an application and your entire makeup application can be ruined. What’s more, false lashes are an often a go-to solution for thicker lashes, but these are a pain to apply and even trickier to maintain for additional uses. Eyelash extensions are typically made of synthetic mink and in some cases even silk These extensions are designed to resemble natural lashes. Each full and partial set of lashes are designed to last for two to four weeks. Eyelash extensions are durable and water resistant, allowing you to swim, shower, and sweat as you normally would without worry of messing up your lashes. One of the best things about lash extensions is that they save you time. Gone are the days of getting up extra early to apply mascara and liners. With eyelash extensions, you can wake up, shower, and go! Eyelash extensions save money in the long run. When you think about how much you spend on mascara, false lashes, lash primers, lash treatments, mascara remover, and other products to achieve long, full lashes, the money spent adds up. You won’t need any of these products, which can save you money. Eyelash extensions are designed to look and feel natural. You and your aesthetician will choose lashes that meet your desired look and once they’re applied, your natural beauty will shine! There’s no need to apply and reapply mascara layer after layer, which can look clumpy and unnatural. 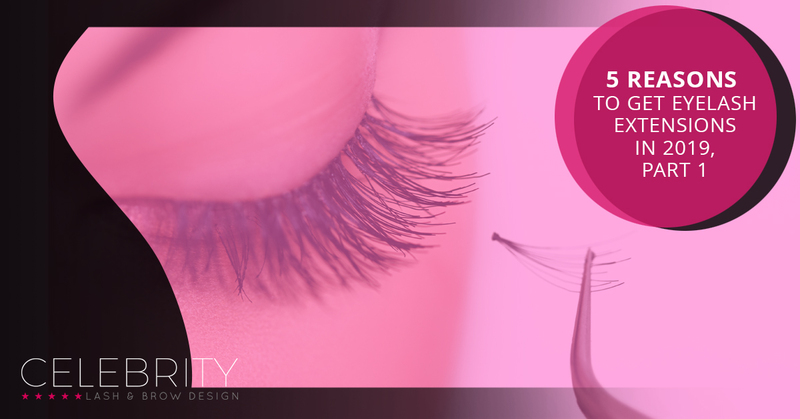 Your eyelash extensions will look voluminous, soft, and free of mascara clumps. Ready to Try Lash Extensions? If you’re ready to experience all the benefits eyelash extensions have to offer, reach out to Celebrity Lash and Brow Design in Glendale. We look forward to helping you look and feel your best in 2019!